A full colour map of the Broads suitable for both waterways and leisure users. This map gives detailed coverage of the Broads with emphasis on the waterways and information useful and relevant to users of the waterways without neglecting other leisure users. The map detail is complimented by information panels and photographs. Our cruising and tourist map of the Broads is at 1:50000 with detailed town plans at 1:12500 for Wroxham and Hoveton, Stalham, Horning, Potter Heigham, Norwich, Brundall, Beccles, Loddon, Great Yarmouth, Reedham and Oulton Broad. A double side map with the map on one side and boating and vistor information of the other. The map shows navigation information, visitor moorings, boatyards, boat hire centres, facilities for the boat user and shops. Tourist information includes places of interest, pubs, nature reserves, windmills, churches, long distance paths, public toilets and caravan and camp sites. The reverse side has detailed boating information including location of visitor moorings, details of facilities at boatyards and marinas, journey times, day boat hire and boat trip locations, as well as contact details and opening times for a wide selection of visitor destinations and attractions, canoe and cycle hire details and some useful waterways contact numbers. The Broads is Britain's largest protected wetland, covering some 300 sq km. Its rivers, broads, marshes and fens make it a unique area with some rare habitats, plants and wildlife. It was the arrival of the railways in the late 19th century that opened the area to tourism. Today it is one of the most popular inland waterways with in excess of 125 miles of lock-free navigable waterways. Other popular activities include fishing, walking, cycling and bird watching. 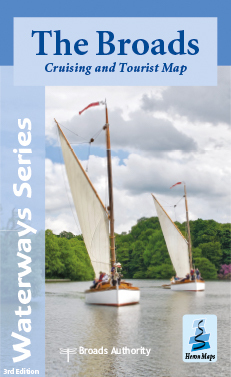 The Broads map is available to buy online or by telephone from our business partner, Guidepost. Click on the logo below to visit their store.